Yum cha has always been one of my favourite things, I used to go with my family frequently from the time I was quite young. Once I became vegan, yum cha at regular places became off limits, as even the items that look vegetarian are likely to have sneaky oyster sauce or chicken stock hidden somewhere in them. 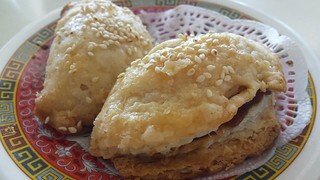 When I lived in Sydney, there were a few vegan yum cha places that I used to enjoy, but when I moved back to Brisbane things looked bleak. 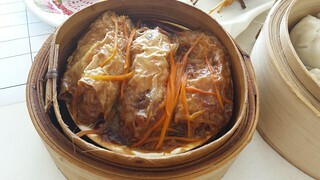 Thankfully for the past several years there has been Easy House Vegetarian, which does a daily lunch time yum cha. As long as you are willing to drive down to the Gold Coast (a bit under an hour from my place)... and believe me, you will be willing. It used to be that everything was vegan except for the egg custard tarts, but I haven't seen them offered at my last several visits, so unless they make a return then everything is vegan. For my non-Australian friends, yum cha is known as dim sum in other places. A little while ago, I went down to the Gold Coast with my friend Amy for a day of eating. 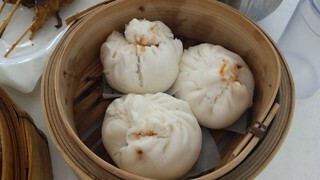 And Easy House was out first stop for a yummy yum cha lunch. 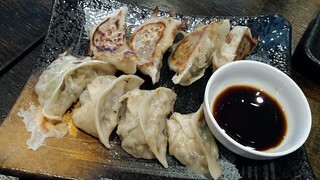 They have a large selection of yummy things - lots of steamed dumplings, steamed buns, small plates and deep-fried food. 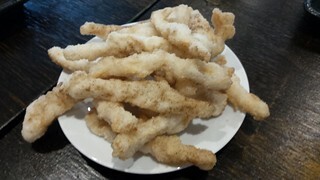 I don't like to eat much deep fried, and there is always plenty for me to choose from! While three is the optimum number for yum cha (because most plates have three pieces), Amy and I still did a pretty good job between the two of us! No prices, because I don't know what was what. They just bring it out and we say yes and they mark it on the sheet! Bok choy and chicken dumplings. 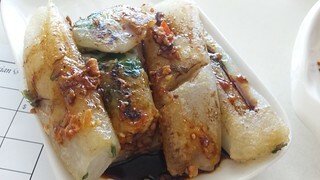 Pan-fried rice noodles with XO Sauce. It was pretty great! We had a couple more food adventures during the day, so stay tuned for those! 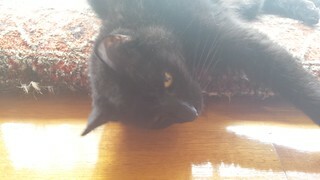 This is one of Amy's kitties. His name is Neil de Cat Tyson. 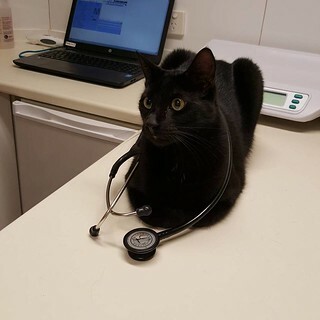 He came to the clinic a while ago so I could give him his vaccinations, and he thought that he would also make an excellent vet. Vegan Diner by Julie Hasson is a fabulous book, and everyone should get it immediately if you don't already have it! You can see my other posts about it here. 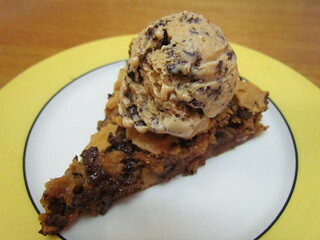 Chocolate Chip Skillet Pie with Peanut Butter Chocolate Chunk Ice Cream: I'll be honest, I don't have an oven-proof skillet, so I used a 9-inch round cake tin for this recipe. When the pie first came out of the oven, it was all puffy on top but then collapsed in when I started to cut it. But this is OK, because what you get is wonderfully crunchy on the top and sides but warm and gooey on the bottom - perfect! The ice cream is also a great recipe. I loved the melted chocolate drizzled through the ice cream. It made a bit of work for the machine, but it got spread all the way through in wonderful crunchy chunks. 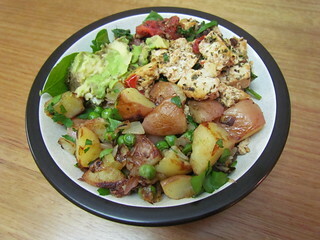 My Big Fat Greek Scramble and Breakfast Potatoes with Peas and Onions: So the potatoes were meant to have capsicum, but I subbed it out for some peas instead. These were nice, with the potatoes going all crispy and brown and the onions being lovely and sweet. I did need to add quite a bit of salt to it though. The scramble was full of onion, olives, garlic, herbs and spinach, and I used chopped tomato rather than capsicum. Very Sloppy Joes: I always think sloppy joes are fun, and this is a great recipe. Based on TVP and mushrooms, with an amazing blend of spices. I could just eat this mix all on its own. Jambalaya: This makes up a big pot, which is great for company or for leftovers. 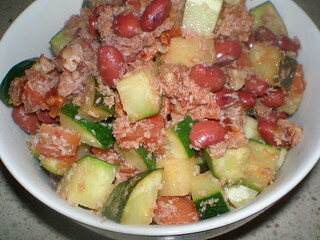 It is full of onion, celery, sausages, tomatoes and peas (in place of capsicum). I searched online and found Creole seasoning recipe to make up a little batch of for this, because I've never seen Creole seasoning here. The recipe calls for two sausages to be sliced and added, but I could have done with more. It also got a bit burnt and crunchy on the bottom of the pot, which was pretty delicious. Veggies and Dumplings: When the nights cool down, a big pot of this will be exactly what you need. 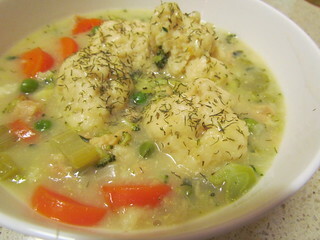 A cheezy broth with veggies topped with delicious dumplings. The dumpling mixture is quite sticky, but it cooks up well. The recipe says to drop small spoonfuls of dough into the stew, I just kind of pulled bits of and plonked in smallish chunks. It is topped with my favourite herb, dill. So good! 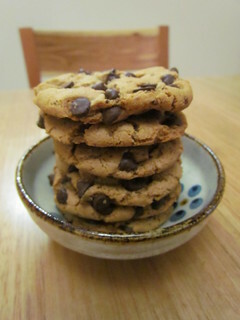 Soft and Chewy Chocolate Chip Cookies: While I am working through all the chocolate chip cookie recipes I have in all of my cookbooks, this is my favourite. They come together so quickly, and with simple ingredients, and they bake up perfect and delicious. Banana Breakfast Bars: If you have some bananas going soft, Julie has you covered with this super yummy bar recipe. I just made a half batch in an 8x8 inch tin, but I kind of wish that I had made the full amount. They are very good! Truthfully a bit sweet for breakfast if you ask me, more an afternoon snack, but whenever you eat them you will enjoy them. 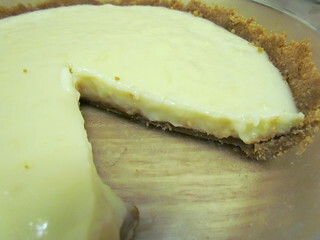 Pineapple Coconut Cream Pie: I know, I know. What am I doing making a coconut cream pie given my coconut issues? But this isn't all coconut cream, it is a mix of silken tofu and coconut milk. I also made this about four years ago, according to the date on the photo, which was before my coconut fat issues really took off, but I don't think there would be enough here to really have an effect anyway. I do really love the combination of coconut and pineapple, and this was super excellent! It did set, though was still a bit oozy. We can't get graham crackers here, so I used digestive biscuits for the base. 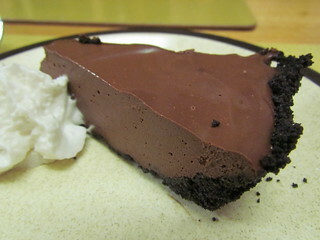 Chocolate Mint Truffle Pie: This is a super rich pie! The base is made out of Oreos, and the filling is a mix of tofu and a lot of melted chocolate. I am often suspicious of chocolate mint things, they generally taste like someone put toothpaste in chocolate, but I am happy to report that this was just right. 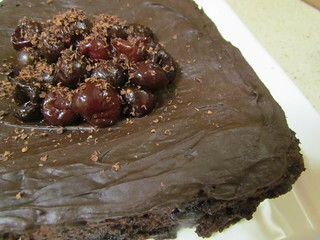 Chocolate Cherry Cake: It's no secret, I love chocolate and cherry together. This cake is so good! The cake has cherry pie filling mixed though the batter. I couldn't find any tinned, so I made some from Vegan Pie In The Sky to use. I also had some cherry brandy essence that I used in the cake and the topping. The cake is topped with a delicious cherry chocolate ganache. It is so rich, but amazing. It seemed to make a lot of batter, so I used quite a tall sided baking pan (a metal one, even though the recipe says glass). 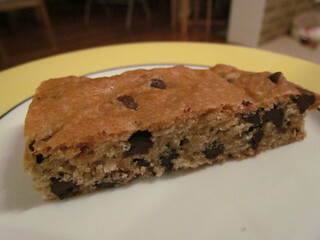 It rose very high, but then sunk in the middle a bit when it cooled. That was OK though, I just filled that little hole up with extra ganache and a pile of cherries. Oh so good. I used this photo to end my last Vegan Diner post, and I think I will probably use it again in future posts as well. Sahara snuck up to check out the time I made biscuits and gravy from the book. 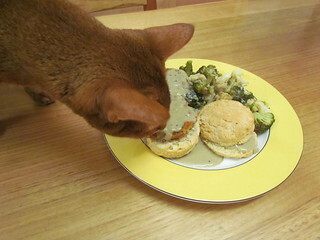 I thought she was going for the broccoli, which is her favourite of all, but she was quite curious about the gravy! She isn't allowed to have any people food anymore, due to her IBD. Poor girl. One Friday, I met up with my friend Ashleigh to visit a Medieval exhibit at the museum before if stopped showing (no photos were allowed in the exhibit, but it was pretty nifty). We also went and saw a 3D dinosaur exhibit, which was super cool! I love dinosaurs. 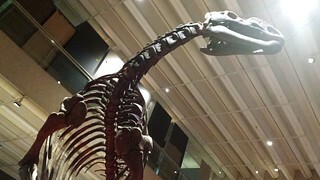 Here's a dino skeleton. I was meeting up with another friend for dinner, but Ashleigh and I decided to visit the Boundary Street Markets (at their old location, they have just had to move) for some dessert first. It was my first (and so far only) time visiting the markets, but we had heard good things about vegan options. 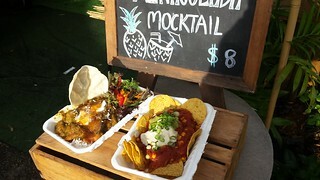 Unfortunately, the cupcake stand that had amazing vegan cupcake flavours had moved two weeks ago to a market on the other side of the city, but there were still lots of things around (including vegan dumplings and vegan paella). One of the stalls there is Get Vegan With Jadda, which had several vegan options (including a few demo dishes out the front the tempt people in). 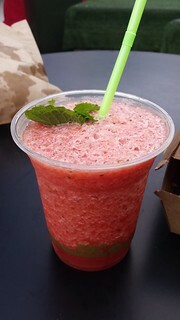 I was going out for dinner shortly, but I was very thirsty after yoga that morning, so I had a Watermelon Daiquiri (just watermelon, mint and ice... no alcohol), to refresh myself. The main reason we were there was for doughnuts. There are two doughnut stalls there - Plant Based Doughnut Co. and The Organic Frog. I had heard that the Plant Based doughnuts contained a bit of coconut oil when they first started, so I hadn't actively looked for them. The girl at the stall had no idea about the ingredients, only the flavours, so I picked a Strawberry and Cream and hoped for the best. It was good, but heavier and sweeter than my ideal doughnut. 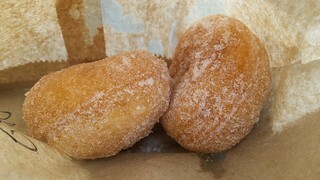 The Organic Frog makes gluten-free vegan cinnamon sugar doughnuts. I had tried one once from The Green Edge, and it was awful - oily and bitter and soggy. Obviously because it had been sitting around on a counter for a few days, because when I had a fresh one it was amazing! Hot and delicious! Fresh from the stall is the only way to go with these ones. We met up with my friend Brendan for dinner at Vegerama West End. 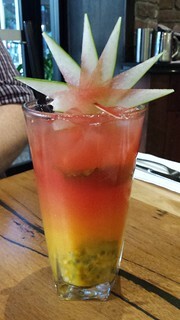 Brendan ordered one of their fancy juices, this time a Tropical Trip (watermelon, orange, passion fruit, mint, $8). 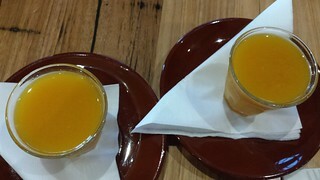 Ashleigh and I each had a turmeric shot ($5). I wish I had ordered a larger drink as well, because attracting the attention of a waiter to refill the water glasses on the table was nearly impossible. Just bring a jug to the table and leave it, I hate having to flag someone down every time I need more water. 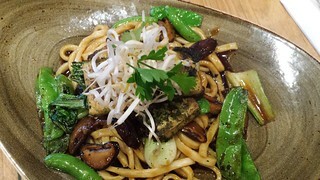 For dinner I ordered the Grilled Tofu Steaks with Stir fry Asian greens, fresh udon noodles, and sesame dressing ($16.50). Unfortunately, although the components wall all good, the sauce was was too salty. A super salty sauce and an inability to attract someone to come and refill my water glass made for an unpleasant time. I was so thirsty! 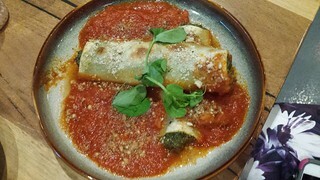 Ashleigh got her favourite Cannelloni (which are gluten-free, $8.50), which she loved. Brendan got one of their pizzas, which was a pretty generous size! No pizza photo because he got it with cheese and I only have vegan food photos on this blog, but they are able to make many of the pizzas vegan and gluten-free if required. After dinner we said goodbye to Ashleigh, and Brendan and I headed back into South Bank (and in search of more water... I was pretty much Fred from the episode The Price in Angel... I would have taken water from anywhere). 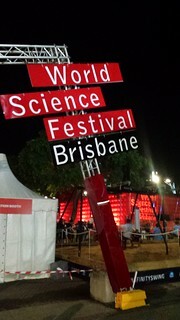 We were going to see a performance of Dear Albert as part of the World Science Festival Brisbane. Dear Albert is a play of three people reading letters between Albert Einstein and people in his life. It was entertaining and witty. Most importantly, it was written by Alan Alda. And even more importantly, while he wasn't in the play, he introduced it and also came on stage at the end for some science talk with Brian Green. Alan Alda, ladies and gentlemen, I just love him! No photos from the play (they weren't allowed), but here are a couple of photos of Southbank at night. We had about half an hour before the show started to have a wander. 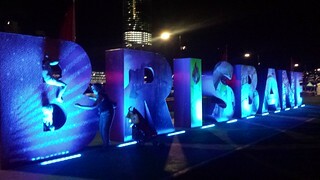 I finally got to see the Brisbane sign all lit up! It was a really fun afternoon and evening. I gave a Sahara update the other day, now for a Dim Sim update. She also had her senior check done. She's had borderline kidneys for the last couple of years, and this test came back showing she really does have kidney disease now. 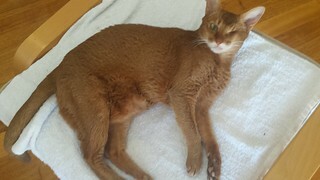 It is only very early (stage 2 IRIS, for those who follow kidney staging in cats), and she is otherwise doing fine. Of course, even though I talk to people every week about their kitty's kidney disease at work, I am not able to be quite so calm about my own baby. I'm a mother first, vet second when it comes to my girls. But basically I am just transitioning her onto a special kidney diet, and hopefully she will stay stable in this early stage for a very long time to come. It has been a while since I have posted a round-up, but now that my travels have calmed down for a bit it is time to get back into the cookbooks! Today's Vegan Cooking for One is an older book, and one that I don't use very often. It is actually quite clever, with weekly menus and shopping lists designed for the lone cook, so that you don't end up with odds and ends left over. The servings are often very generous. I have posted previous round-ups from this book here. The book is divided into summer/spring and winter/autumn recipes, all of these come from the latter. 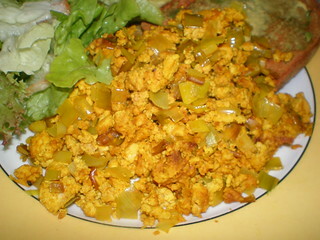 Scrambled Tofu and Leek: This is a standard scramble recipe, with turmeric and mustard and soy, but I like the addition of the leeks. It is served with toast, which I made avocado toast because that is the best. 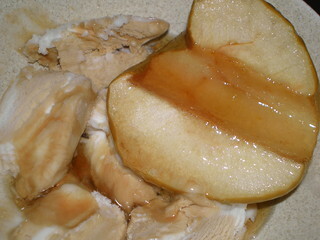 Baked Maple Apple Halves: The book includes a Sunday dessert in each week's menu. This has only four ingredients, and smells lovely during baking (while it takes moments to assemble, it does need to bake for awhile). Servered here with some vanilla soy ice cream. 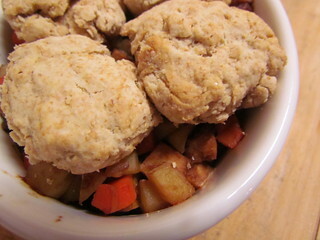 Irish Stew with Frozen Tofu: This was a big serving, and very hot and satisfying. She uses yeast extract (aka Vegemite in this neck of the woods) for a lot of her stews, which lends a great savoury flavour. 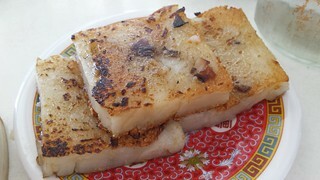 The tofu is frozen and then defrosted to give it a different texture. Plus, biscuits on top! 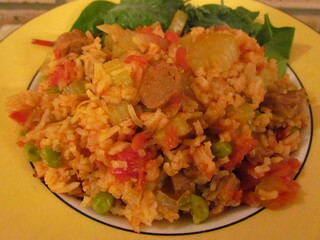 Jambalaya: This was verging on meh, I have made much better versions of this recipe from other cookbooks. I subbed zucchini for green pepper here. It also had coconut and walnuts in it. 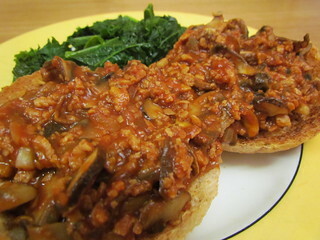 Savoury Eggplant on Toast: This is one of the Sunday lunch recipes, and is a different take on savoury toppings for toast. 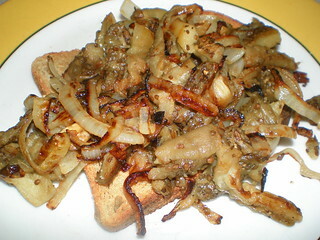 It is quite simple, eggplants and onions sauteed and seasoned. I found that there was too much onion compared to the eggplant in this dish, you need to reverse the ratios. 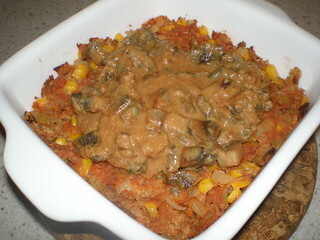 Tempeh and Sweet Corn Roast with Tahini/Mushroom Sauce: Another big and satisfying hot dinner. I needed to add a bit of extra tomato paste and water to the roast, otherwise the mix was a bit dry even before baking. The sauce was nice, I love tahini. Baked Pears: This is very simple and plane, literally just a pear roasted with some sugar, Nuttelex and ground ginger, but the result was nice. Definitely great served with ice cream. 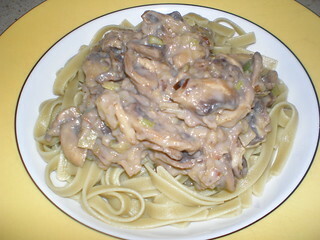 Noodles with Creamy Leek and Mushroom Sauce: The leeks and mushrooms were great in the sauce, but I had to thin it out with a fair bit of extra soymilk, otherwise it goes very gluggy and isn't at all suitable to mix through noodles. 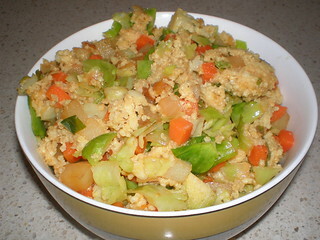 Millet and Vegetable Stew: Even though I decreased the millet from 1/2 cup to 1/3 cup, this isn't really a stew because it was not brothy at all. It was more like a pilaf-style dish, which was fine. It had miso and sage and veggies in it, so was tasty. 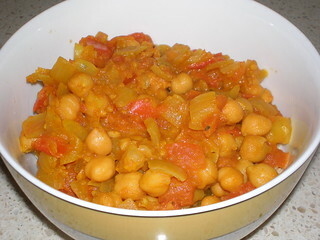 Curried Chickpeas: This was OK, but there are much better curry recipes out there, that are not necessarily a lot more complicated than this one. 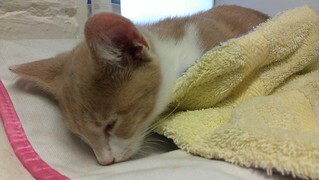 Here is a very sleepy kitten, all tucked in. He is actually sleeping on top of my laptop bag, which was on the bench at work, and then we tucked him in with a blanky. 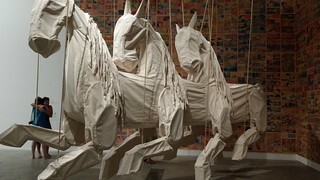 A couple of months ago I went to see the 8th Asia Pacific Triennial exhibit at the Southbank art galleries with my parents and my friend Ashleigh. Of course a trip into the area would not be complete without some yummy noms. We went for an early lunch at Vegeme, which had opened a while ago in West End. It was the first time we had all been there. 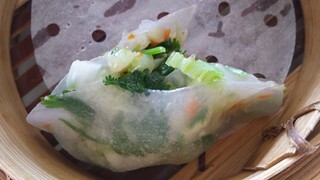 It is an Asian-style vegetarian restaurant, with many vegan items and options on the menu. It also has gluten free vegan items and options, which was important because Ashleigh is a GF-vegan, so we definitely wanted her to be able to eat a good lunch! I had recently done a very sweaty bikram yoga class, so I was after some refreshment. 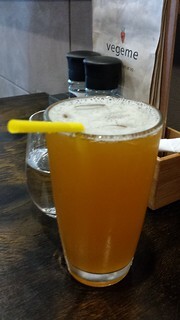 I ordered a nice Mango Green Tea ($4) to go along with the regular water. 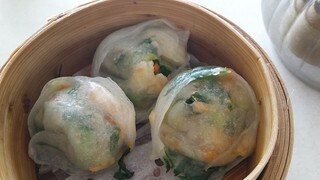 I would say that Vegeme's strength lies within its Small Dishes menu section, which could be put together to form quite a nice yum cha-style experience (or dim sum, for my non-Australian readers). We ordered several things from here, the highlight of which was the pan-fried dumplings ($8.50) and the radish cakes ($5.90). 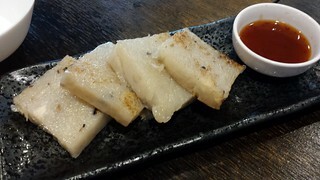 I am not sure if I have mentioned how much I love radish cakes (or turnip/yam/lobok/whatever you want to call them)... but I have a very deep love for them. 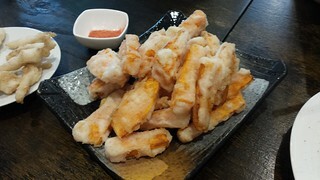 Ashleigh enjoyed some of their gluten-free and vegan deep-fried delights - the Salt and Pepper King Oyster Mushrooms ($7.95) and the Sweet Potato Wedges ($6.50). The mushrooms had really good seasoning, but I could only try a couple before the fried got too much for me. 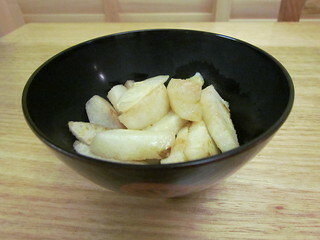 The wedges came with plum salt, which I love, but I was not a fan of the batter at all. I pulled it off and dipped the nekkid potato into the salt. Bear in mind though, I can't tolerate a lot of deep-fried food, so this is just my opinion. 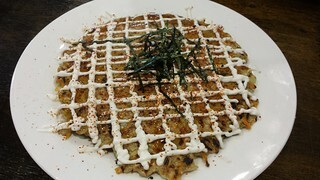 Mum and I shared the vegan-option for the Okonomiyaki ($9.50). We are both lovers of this Japanese dish (my mum the egg-version normally, as she is not vegan), and it is rare to find a vegan version. Unfortunately, this wasn't great. It was gluggy to begin with, and the middle of it was mostly raw. I would not recommend. 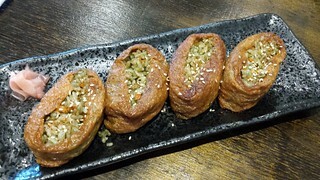 We also ordered the Pan-Fried Inari, which was from the Rice Section of the menu, though really they belonged with the Small Plates as they would not be a meal in themselves. 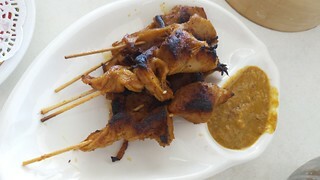 These were quite delightful, with basil and lemon fried rice stuffing. After this we walked around the galleries for a while, looking at the installations. 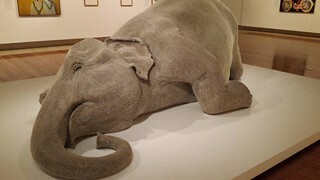 I must say, the exhibit wasn't as strong as it usually is. But I did find a few pieces I loved, including these giant horse sculptures and a beautiful but very sad sculpture of a dying elephant. After filling up on culture (and I bought a cool Cat Therapy colouring book), it was time for dessert! We hit up Beach House for some more pay-by-weight soft serve fun times. 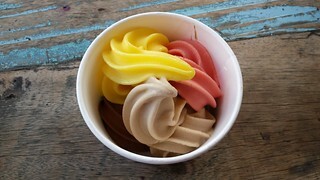 I had peach, strawberry, nutty (which was hazelnut) and chocolate. Such a yummy mix! We also stopped by Doughnut Time to pick up some doughnuts to take home. 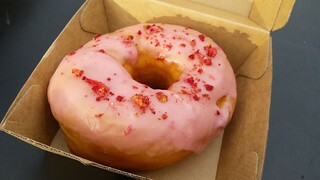 Doughtnut time has two vegan options available (though sadly for Ashleigh they have stopped making them GF as well). 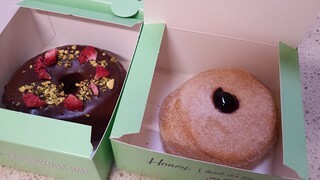 I got one of each - The Vegan Fox (chocolate glaze with strawberry and pistachio) and Blue Ivy (cinnamon sugar with blueberry filling). The Vegan Fox was a bit sweet in the glaze for me, but Blue Ivy was spot on what I love. Unfortunately they have since rotated Blue Ivy out of their repertoire and replaced it with another glazed vegan doughtnut. The tragedy! You were so sweet and concerned after the old photo I posted of Sahara with her bandaged leg in my last post, here is a photo I took 10 minutes ago to show you that she is all good! She is 14 now, and does have issues with IBD (which is tricky to manage, so she is on some serious drugs) and arthritis in her front legs, but she is still a very happy and purry and sweet little cat. The girls just had their senior checks done at work, and Sahara's bloods came back as all good!